With just three ingredients this easy and simple recipe for Crock-Pot Caramel Apple Cider comes together quick in your slow cooker. 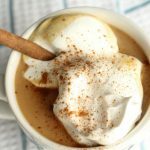 The hot apple cider is just the thing to warm you up and this recipe tastes just like the autumn favorite at Starbucks! My husband loves to get jugs of fresh apple cider from the local orchard. Heating it up with a little caramel and cinnamon helps bring out the flavor. And makes for a great drink for the family to enjoy around a fire inside or outside. With only three ingredients in this easy recipe it comes together in a snap with the hardest part being unwrapping all of those caramel candies. If you have children however, this is a great task to give to them. Just buy some extra caramels as I am sure a few may go missing as they sample the caramels. 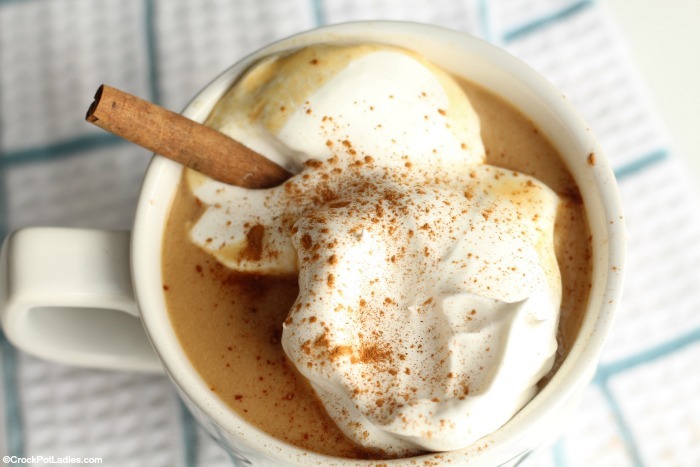 I like to top cups of this warm caramel apple cider with some whipped cream, as the whipped cream melts into the hot cider it adds a nice creamy texture that enhances the caramel in the cider. 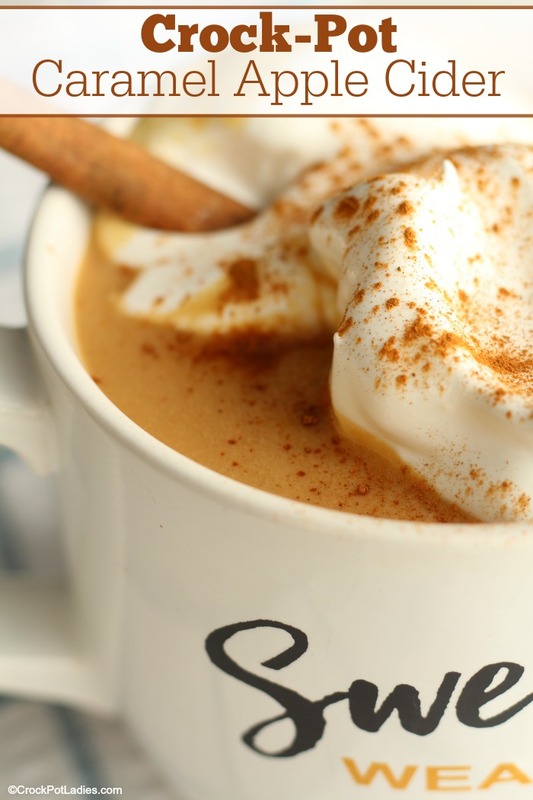 The perfect fall sipping drink! With only three ingredients this recipe is quick and easy to prepare and the flavor combination of warm apple cider, cinnamon and caramel is the perfect fall treat! Add cider, caramels and cinnamon to a 3 to 6 quart or larger slow cooker. Cover and cook on LOW for 2 to 3 hours or until the caramels have melted. Stir hot apple cider to mix up the melted caramel into the cider. Turn slow cooker to WARM to keep hot for serving. Top each cup with whipped cream if desired. This recipe can easily be doubled or tripled to serve a larger crowd. Any reason this wouldn’t work with your monshine recipe? Sound even better than the cinnamon!! Thanks for all your posts I am going to try several! NO!! no reason this would not work. It would be tasty too. You could add a little Hot Damn to the mix and have Hot Caramel Apple Cider Moonshine.